Only in fictional tales would you expect these two things to collide. Firstly, Ruby Macintosh and her epic debut album launch, which at midnight turned into the 16th anniversary of my father’s passing away. This is not fiction though. It is a wonderful weekend and a celebration of all that is good. When I found out nearly a year ago that Ruby’s album launch was to be on the evening of the 19th October 2013, I gulped a big gulp and said, “yeah.. sure!”. Ruby has been a busy lady. For nearly 18 months by my reckoning she has tirelessly gigged and busked her new material and expanded her fan base and generated funds for this rather wonderful and unique venture. Even on Ruby explaining her album intentions to me, I began to feel the magic, and so signed up for a voluntary sleigh ride into the world of #TEAMRUBY. This team of people turned out everything from sandwiches to mixes of a track to nipping into the post office to grab a book of stamps to get the artwork off to the publishers on time. Anything from chucking a £1 coin in a guitar case to hoisting up the stars in the rafters of the stage… Team Ruby was being built over time and all within it had the one single goal in mind… It was time to get this girl where she deserves to be. On that stage, and successful in whichever way she chooses to manifest success. Why? Have you heard her sing yet? Just… wow. The fact that this lady happens to be one of the nicest people you could ever wish to meet simply adds to the passion of all who wish her to do well. It’s not for me to regale every dotted i or crossed t. All I did was try to act like Polyfilla and turn my hand to whatever Ruby needed at that time. Aside from my poorly time off, it really was one of the most fabulous projects I’ve ever had the pleasure or opportunity to work on. The day of the launch arrived and in all honesty, I was worried. I had not felt great in the days leading up to the gig and even though technically I was only playing a few songs, I *knew* one of those was going to knock me physically off my feet. On this occasion it was possibly going to be a Ryan Killer if I wasn’t careful. I knew I had to approach the day with as little anxiety as possible, and with as much stored energy as possible, so that when Lady Killer came around, I knew I could go for it regardless of how I felt, and know that I could recover for however long afterwards. This was Ruby’s moment, and I wasn’t about to welch on what turned out to be one of the best nights of my life. I arrived at the theatre in time for rehearsals and watched a very organised yet busy Ruby prancing around in a onesie, with rollers in her hair, yet managing to stick to her time schedule for the day to allow everything to go without a single hitch whatsoever. Rehearsals went fabulously well, and the stage and lights began to take shape around the ever-increasing atmosphere of this wonderful 1930s building. The electricity of anticipation throughout the day managed to remove any real nerves and leave only pretty butterflies. Break time and home to get sorted out and changed. At this point I double check that Marion and Stuart are OK and they in fact have already made it to Wakefield Nando’s… To my rather envious tummy this was bad news, but I grabbed some white bread sandwiches and let them soak up the worst of the nerves. I hope I could hold out for this. Thanks to a slick day, my symptoms were minimal by the time the doors opened and as the lights cooked the glorious looking stage I began to relax into Ruby’s night. It was so well put together. As a member of the audience I stood at the back, and watched my best friend take the lower stage and sing her heart out, wearing her heart on her sleeve and making jokes that endeared her all the more to the 120 strong audience now gathered at beautiful tables like some audience with Victoria Wood. This was better. Victoria Wood can’t sing like Ruby. The first set was a superlative arrangement of carefully chosen covers which as time progressed added guest friend musicians who were featured on the album. It was done in such a way as to separate the two sets visually and actually used the first half to promote the other side of what Ruby does day in and day out… She makes music for a living. This was a chance for her audience to see just how much she has developed as a performer and how she now interacts with great quality musicians. There were no fillers here. This was a show-piece introduction to the main event, and it was executed perfectly. The audience were divine. These were an eclectic mix of friends and family and members of #TEAMRUBY, along with long time followers and fans who Ruby has picked up along her hard-working journey. Every person there was attentive and there to see Ruby, and to listen to her. We could hear her as clear as a bell. The sound guys. Well bloody done! Then there was the team from the theatre, John, Paul, Paul and the awesome guy who did the lighting and smoke machines. I’m not sure I’ve ever seen a stage look so tasty to be honest! Slick team of people who you would hardly know had even been there. True professionals who I hope to work with again one day. Top job!! And the list of #TEAMRUBY helpers on the night continues, with Suzanne Denton-Barber sorting the door and Elspeth Macintosh firing food every which way she could, and Chris Sharp on CD Sales and T-shirts, and Joss Barber helping on the stalls and then Elliot and Tom and Alex whizzing around like video ninjas putting together the footage with camera friends Allan and Ron shooting from the side-lines grabbing some amazing shots of the night. Talented people all working together. It really was a well-oiled machine and the resulting atmosphere made for what I can only describe as a perfect night. The musicians involved on the night were *mostly* on the album with the addition of a couple of other wonderful musicians who were unable to make it on the night. Everyone performing at the gig was having a blinder. Everyone not only nailed their parts, but delivered them with the same amount of style that was oozing from the ever-appreciating audience. Something special was going on. The second set saw the curtains drawn back and “Ruby” appears on the back of the stage in huge red glittery writing. Stars dangle from the ceiling in hues of yellow and orange and blue. The stage plumes smoke which catches the purple, pink and blue lights and Rob Taylor walks out alone to the drum kit. It happened to be my drum kit… Boy he made it sing! Thomas Maddison joins the stage after a few cheeky bars from Rob. 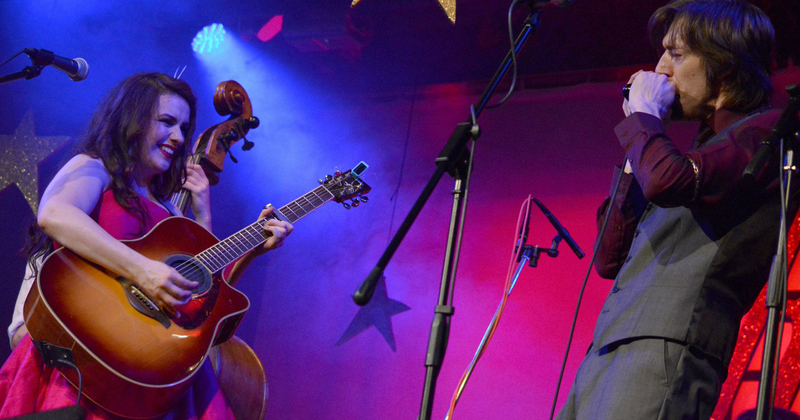 Ross mooches out into the side of the stage and starts jabbing chords and I take my turn to waltz my way to Bessie the Bassman and hit a few licks. The brass section walk out and weave across the stage… The tension building as the parts synchronise. The backing singers strut their stuff and hit their pitch perfect lines… It’s time. Ruby takes the stage. What a warm and wonderful welcome!!??! The audience go mad for our heroine as she owns a walk to the microphone, grabs her guitar, and wallops into Hey There Cutie. The next 9 songs for me were a blur, including the encore. I remember everything, especially what I felt performing with such a great group of people, and I remember every caught eye, every look and every smile as each piece took its place on the sound stage proudly lifting Ruby up for her to shine and show us the best performance I’ve ever seen from her. She was absolutely amazing. Oh yes. Lady Killer. I remember walking forward as rehearsed, closing my eyes and taking a deep breathe. Thanks to the help I had in the day I managed to keep it together long enough to get what was in my head across to Ruby and the audience. It was an utter thrill. Seeing the pictures of it afterwards still make me feel tingly. I therefore had my own little team to thank too. Cat Thompson, looked after me and made sure I was at the theatre on time and chauffeured me and my equipment around aplenty. Chris and Seb deserve huge thanks too for helping to lug all my gear about so I kept my energies for the show! Again, huge thanks you three. I like mike doubling as an NHS network service! Bless you! Thanks also to Ruby for the organisation of the fabulous Shackleton!! I did need that sit down! With Lloyd assisting on confidence boosting and the arrival of some of my oldest friends… Add to that the wonderful generosity of my step-dad Rod Young, lending me his 1978 Gibson 335 and I had it made! Thanks so much Rod! The show finished with a bang, and the response at the end really was fantastic! I’ve not felt that much love in a room for years, I certainly felt appreciated and therefore I can’t imagine how Ruby must have been feeling. A whirlwind evening with an after show party to get to! We can’t get there just yet though… Ruby is *still* signing CD after CD after CD… Tonight really was everything it was supposed to be. A show-stopper. Bloody brilliant! We pack down our things for a quick getaway during the morning pack-up and say our goodbyes. We spend a few hours catching up and chattering the night away and many friends are made and many networks spread amongst the members of #TEAMRUBY who now adorned The Hop. Eventually, someone makes the declaration of “PIE! !” and we head inevitably to “The Pie Shop”, as much as anything, to enlighten our well-travelled guests as well as to line my tummy now it was free of butterflies once and for all. By ‘eck I am glad that Harmonica solo went al right! I sit and eat pie and ask Cat the time. “2:17am”. I pay my respects internally as the clock ticks past 2:20am and I observe my dad’s anniversary of passing away. I reflect there, in the relative madness of the pie shop, that I *knew* he was there on stage with me, and gave me the extra boost I needed to pull off the solo I had in my head. I thank him for what he passed on to me and for sharing the evening with me and my amazing friends. Then I eat another chip. The time couldn’t have been marked in any better way. This was a gig that inspired me and made me use music to achieve a personal victory of simply “managing to do the gig” without feeling like a bag of smashed crabs. Yes I suffered the next day, and the next few days after that, but I won’t remember that bit at all. I’ll simply remember Ruby, walking out onto the stage, and performing the gig of her life. I was honoured to be a part of it. I get home after delivering our guests to their temporary and well post-it noted accommodation and grab some well-earned zeds. My word. It did take some time for my head to stop replaying everything in slow motion for days afterwards! I made sure I enjoyed the following day. Cat helped me pack my things and I got everything home OK and even managed a quick and spritely Starbucks with our esteemed and bloody brilliant guests and saw them on their travels safely. I did my best to recover after that but by 6pm I was sat in a squeaky chair in a radio station in Halifax, about to be all emotional with my first ever Radio interview with Simon Frost for YUBS on Phoenix FM. I’m not sure I could’ve coped had Cat not been there for moral support. I was nervous and gabbled at a ridiculous pace but I tried hard not to be too hard on myself. It’s been a long time since I played in public. The show really was a right laugh and meeting Simon was a fantastic experience. I managed to not make any blatant mistakes with my own songs and ended up not hating myself by the time I set off back home. I’ll add the link to be able to listen again when it becomes available. To mark the occasion in true fashion I had my dad’s traditional favourite Chinese meal (altered slightly for tummy reasons of course!) and settled for a night of listening to his old songs and smiling to myself with happy memories. I couldn’t have wished for a better weekend. I wanted to post this as a memory to myself really, so that I can look back in years to come and find all the links in one handy spot and the like. I do like this blogging thing. I’m hoping anyone else who did make the night hold their own dear account of events and can relate and look back on this in the same way as me. If you didn’t make it, I hope then that this serves as a small hint of the evening that you sadly missed. All is not lost… There will be more videos forthcoming. Well done Ruby Macintosh… You’re an absolute star. 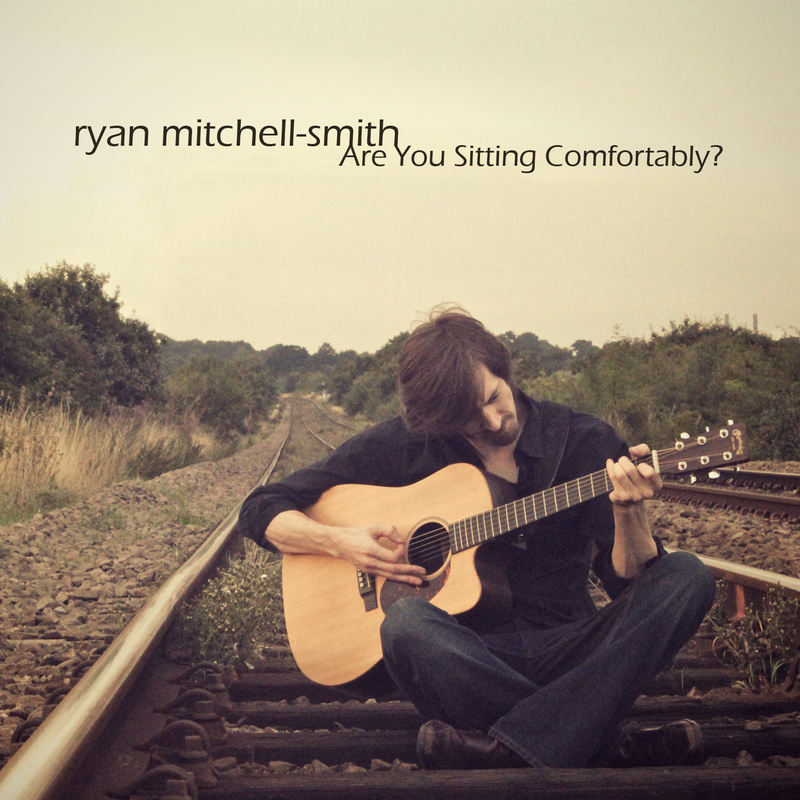 Ryan Mitchell-Smith: Are You Sitting Comfortably? And there you have it! The artwork is in the final stages, with the covers finished and CD inlay all sparkly and fresh and new! The CD will be a 4 panel Digipak with an 8 page booklet containing the lyrics which match up to images that have been specially chosen and created by Tom and myself to represent the songs in a unique way. To see that booklet though, you’re going to have to buy a hard copy! ;) We really did want to create something that people would want to own as a *thing* in its own right, rather than something that was intended primarily for digital download like my last album was. Hopefully you won’t be disappointed! The album itself is currently nearing the end of the rehearsal stage, with all the main parts now being finalised along with the final structures. The track-list has been set and the recording stage will begin soon after Ruby Macintosh and her amazing album gets launched in one week on 19th October! My album “Are You Sitting Comfortably?” is due out in late 2014. Back in August 2013 I was visited by a rather unusual guest. I say guest, as he had taken residence in my house. He was a Butterfly, who I named Paul for silly reasons, and this is Paul’s very true story. Being the summer it was warm. I’d been out in the back garden attempting to stretch my legs whilst the weather had been nice and had come inside to get changed and grab a shower. The jogging bottoms I wore on the 7th August were tossed carelessly onto my chair which sits next to my dressing table in my bedroom. Ridiculously, those joggers stayed there for nearly a month, as I *forgot* I’d decanted them there. When I picked them up 3 weeks later I noticed a dark wedge shaped *thing* clinging on for dear life at the bottom of my joggers. A Red Admiral Butterfly. It was a lucky spot, they were on the way to the washing machine, and rightly so. I carefully put the joggers on the floor and gathered Paul Butterfly carefully into my hands and took him downstairs. I waltzed delicately into the back garden and took him to the end of the path and gently let him go. I walked back inside with him on my hand and picked up my camera and got some lovely shots of him, which you can see by following the link at the end of this story. He took his time but finally took flight and fluttered onto my kitchen window frame. He stayed there for a few hours, grabbing some rays and recharging his batteries. Eventually I checked and he’d flown the nest. It made me smile for one, but the simple fact was, he’d been hibernating or some such thing in my bedroom for ages now! He must be shattered and starving! So August turns into September and I believe the story is over. It is not. On Sept 14th I wake up and find, to my amazement, just under my large poster of Stevie Ray Vaughan which adorns the wall above my bed, sits a dark wedge. I gasp, and surely assume this cannot be the same butterfly, now merely one meter away from where I first met him. It can’t be Paul? Can it?!? I go and get a glass rather bewildered and safely imprison him temporarily for his own good. I again walk the miraculous creature downstairs and into the back garden. I let him go and again he takes his time. Red Admirals look the same. 2 Red Admirals having a kip in my boudoir is a little weird. So that’s it. Isn’t it? 28th September. My 36th birthday. I wake up. One dark wedge, sat just *above* my Stevie Ray Vaughan poster. Another Red Admiral. I burst out laughing. I look across to the photo of my dad on the opposite wall and chuckle even more. I’m not a religious chap, I just feel my dad’s spirit sometimes, normally when I set a gobiron (harmonica to non-yorkshire folks) to my lips and close my eyes to play. I felt my dad’s spirit alright. Not necessarily in Paul, or butterfly number three, if indeed that’s who it was, but the simple fact is, that I got a happy birthday from my dad, however I look at it. I again gathered him up and took him outside, and once more he stuck around, and carefully fluttered away into the morning. A sunny morning.